Nothing says summer better than an afternoon spent chilling by the pool with a refreshing drink in hand. The issue is that many of our favourite refreshing summer drinks are loaded with sugars, and that just isn’t what our summer bikini body needs.! Well, I’m going to share with you 5 refreshing detox drinks which are nutritious and will even help you to cleanse the body, giving you a flatter tummy. In a jar, add ice cubes, coconut water, watermelon cubes, slices of lemon, lime and mint leaves. Stir it gently and enjoy! Watermelon is 92% water. It is one of the highest water-content fruits. Fresh coconut water is one of the richest natural sources of electrolytes. This combination makes this drink extremely hydrating and can help to reduce fatigue and speed up muscle recover after a workout session. 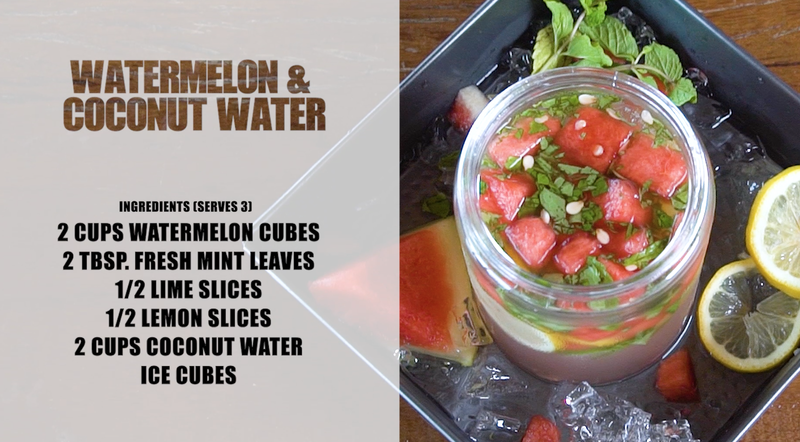 I’ve infused mine with coconut water, watermelon cubes, lemon and lime slices and fresh mint leaves. This drink does not only tastes great, but it also looks beautiful, which can be served as a healthier alternative at a pool party over the typical sugar loaded sodas. Steep tea in hot water for 5-10 minutes. In a jar, add ice cubes, green tea, honey, and lemon slices. You must know by know that I drink green tea and lemon water on a daily basis. Well, this next detox water combines both! Green tea is high in antioxidants and can help to reduce the accumulation of fats especially around the belly area. Lemon water aids digestion and is a great source of vitamin C.
I’ve served mine over ice with green tea, freshly squeezed lemon juice, you can choose to sweeten it with a little bit of honey and decorated with some lemon slices. You can drink this on an empty stomach first thing in the morning, to get your digestive system moving and prevent constipation. Wash and place barley in a small pot with 3 cups of water. Bring to a boil over medium heat. Once boiling, reduce heat and simmer for 15 -20 minutes or until the barley turns soft. 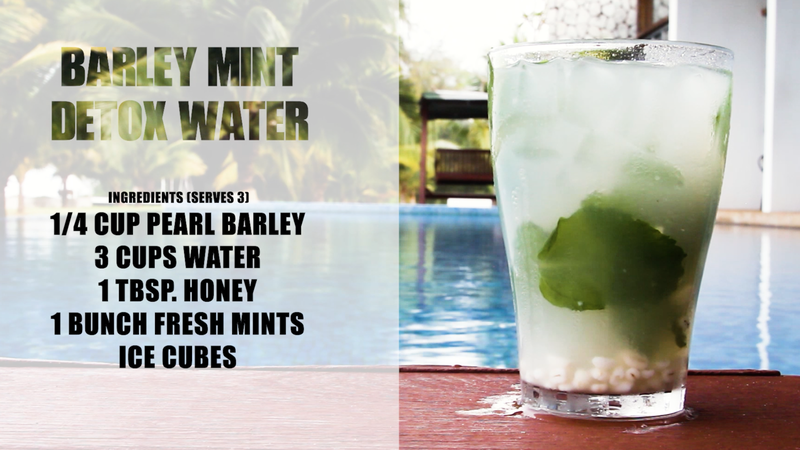 In a jar, add ice cubes, barley water, honey, and mint leaves. Stir it gently and enjoy! I grew up drinking barley water almost on a daily basis. Consuming barley on a regular basis keeps your colon and intestines happy and strengthens the immune system. Simply cook about 1/4 cup of pearl barley with 3 cups of water until barley is tender for 30 minutes. I’ve served mine over ice with barely water, fresh mint leaves and sweeten it with a little bit of honey. Serve chilled! You can even consume the barley, which is packed with fibre and keep you fuller for longer. Do also check out my Barley Recipes here which you can make for breakfast, lunch and dinner. Wash the useable portion of the lemongrass. Bring the water to the boil over high heat in a pot. Bruise the lemongrass stalks to release the oils and place into the boiling water. Simmer covered for approximately 30 minutes. In a jar, add ice cubes, and pour the lemongrass water into the jar, then add lime juice, honey, lime slices and mint leaves, stir well and serve! Lemongrass is one of the most common herbs used in Asian cooking, thanks to its citrusy aroma and health benefits. 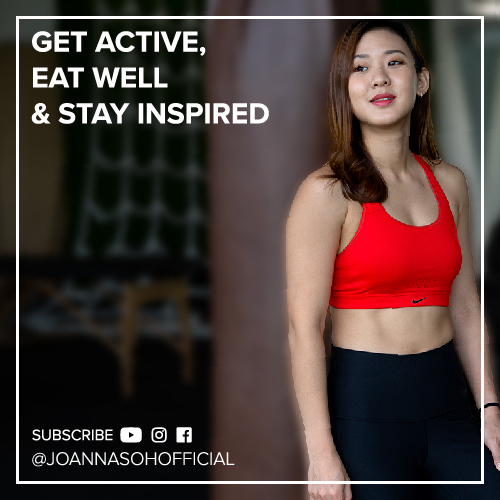 It soothes the stomach, keeping your belly healthy and happy. 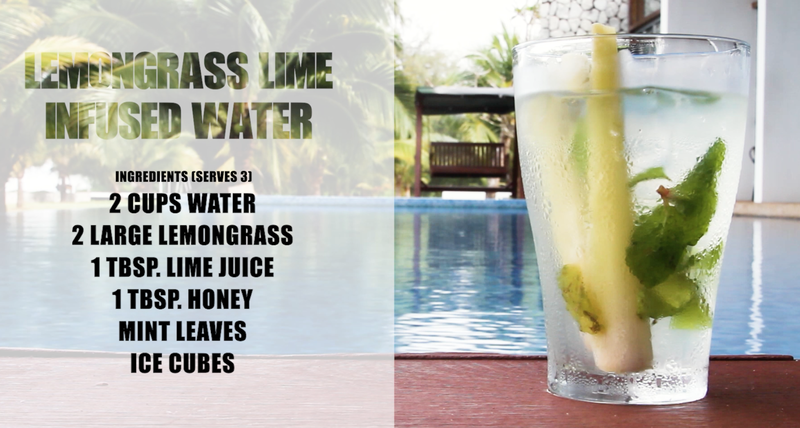 To make this, bruise and cook 2 large lemongrass in 2 cups of water. Allow it to slowly simmer for 30 minutes in order for the lemongrass to release its taste and fragrance. I’ve served my lemongrass water over ice with a handful of fresh mint leaves, a few lime slices, some lime juice and sweeten it with a little bit of honey. 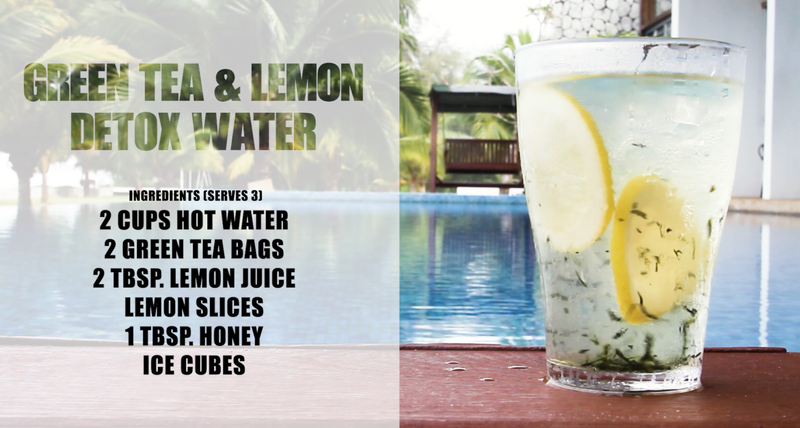 This is a refreshing drink which is perfect for the hot weather. Plus the aroma of this drink will keep you calm. In a jar, add ice cubes, coconut water, lime juice, cucumbers and lime slices. Stir it gently and enjoy! One of the easiest ways to keep yourself hydrated is to drink coconut water. In fact, it’s a much better option than sports drink, without added sugars or artificial flavourings. 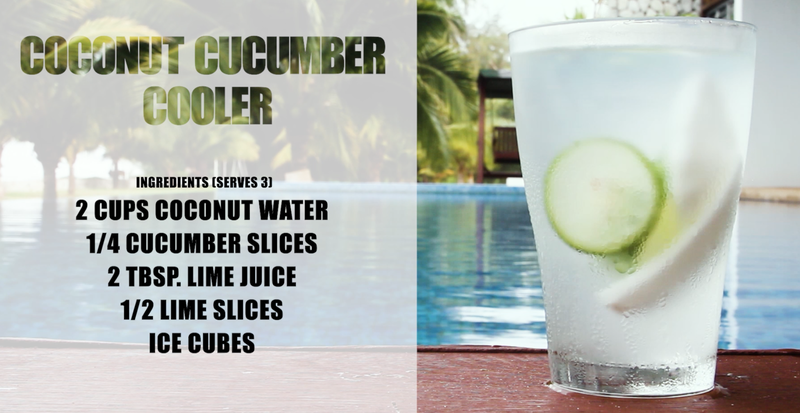 You can simply drink it on its own, or make it fancy by infusing coconut water with lime juice, lime and cucumber slices. So make this summer a fit one by consuming these detox waters. 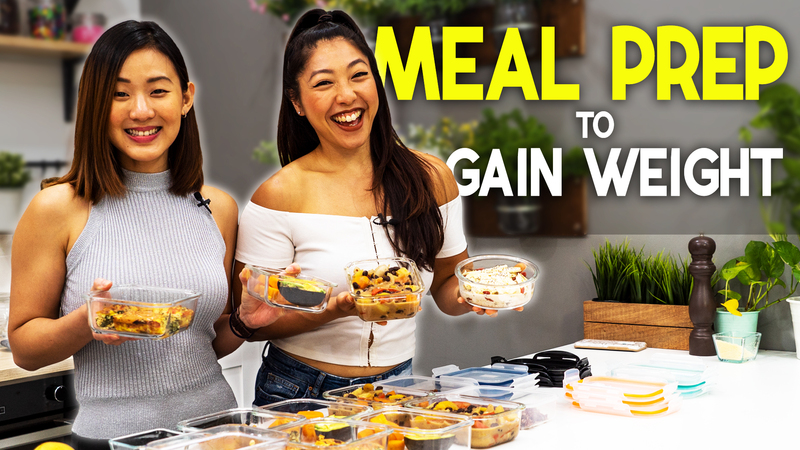 Plus, you’ll be pumping plenty of vitamins and nutrients into your body that will naturally help reduce inflammation, boost energy, cleanse the liver and promote healthy skin. You can prepare these super refreshing fruit and vegetable infused detox water in advance, and bring them with you to beat the heat.